On this walking trip, you will venture away from the famous beaches and cosmopolitan towns of the south up into the Alta Rocca. Carpeted with heather and wild herbs, your trail will lead you through sleepy perched villages, pink granite pinnacles and archeological sites whilst never failing to offer breathtaking views of the coastline below. One of the most popular long-distance footpaths on the island, the Mare a Mare South trail crosses the rocky spine of the island between Porto Vecchio Gulf and the Valinco Gulf, taking in the full cross-section of Corsican landscapes from the deep blue inlets of the coast to the beautiful forests and high peaks of the Alta Rocca region. It will also offer you the opportunity to take cooling dips in the clear waters of the many rock pools and rivers along the way. All in all, this is an ideal trip for those looking to swap the hustle and bustle of the coastal south for a more off-the-beaten-track experience, spectacular mountain scenery and timeless village life. Fly to Figari and spend the rest of the day exploring Porto Vecchio. Night in Porto Vecchio. 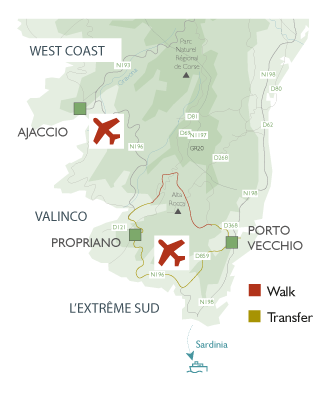 Your walking circuit starts in Porto Vecchio. After a short taxi transfer to Alzu di Gallina you will start walking towards the mountains. Passing through the Ospedale villages you will reach Cartalavonu situated at 1020m altitude. 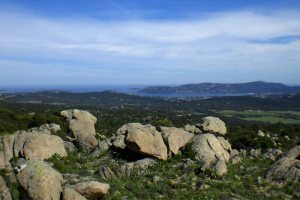 The trail will take you through the Corsican maquis and under maritime pine trees until finally reaching the plateau of Cartalavonu. The start provides you with a beautiful viewpoint over the Gulf of Porto Vecchio and the lake of Ospedale.You take a short detour around the summit of Vacca Morta (which also rewards you with great panoramic views). After passing through the Col de Mela, you discover the needles of Bavella mountains and the charming little village of Carbini. Your last section takes you through Levie and a couple of archaeological sites, the most famous being Cucuruzzu, dating back from the Bronze Age, before reaching San-Gavinu-di-Carbini. The path you follow leads you through shaded undergrowth and runs alongside the stream of Pian di Santu. You will walk into the heart of the Alta Rocca villages, from Zonza to Quenza - an absolutely charming walk! Distance: 10.8km. Around 4 hours walking. Altitude gain: +470m. Descent: -340m. Quenza is famous for its church that dates back to the year 1000. You leave this village and hike up to the plateau of Cuscione and the hamlet of Giallico, before descending through scrubland and pass by the shepherds' huts of Lavu Donacu before reaching your stop for the evening. Today's walk commences through a chestnut forest and Serra di Scopamena and you will notice the old mill that has been restored by the Corsican Natural Park. In the shade of the oak trees and thick vegetation, you can swim in the local fresh river while enjoying your surroundings. You will then climb up through the middle of oak and strawberry trees to the Col de Tavara and the hamlet of Altagène. A bend in the path then takes you through the scrubland to the bell tower and olive groves of Santa Lucia di Tallano. Night in Santa Lucia di Tallano. Distance: 13.5km Around 5 hours 40 walking, Altitude gain and loss +740m, -1140m. Passing the XII century Roman chapel St-Jean-Baptiste, the path descends through a forest of oak trees to the Piombatu Bridge that crosses the Rizzanese. You will head towards Fozzano, a village famous for a story from Mérimée. After which you will make your way towards Baracci, crossing the Capannajola and the Baracci river close to an old water mill. Distance: 15km Around 5 hours 20 walking, Altitude gain +880m. Descent: -1130m. After breakfast in Burgo you will be transferred to Figari airport for your journey home. The walks are on good footpaths and trails although terrain is often rocky and rarely flat. You need to be used to walking all day and take regular exercise to enjoy this holiday. There are many uphill and downhill sections. We describe this walk as moderate with strenuous sections and encourage walkers to use two walking poles.The paths are well trodden and way- marked but you still have to be attentive to your maps. You can walk at your own pace, choosing when and where to stop. There are often other walkers on the same itinerary that you will bump into along the way. We transport your bags between the hotels, provide maps and good walking notes. This is a way of enjoying complete flexibility, you dictate the walking pace and rhythm of your holiday. You will need to carry a day sack only, with your water bottle, camera, picnic and weatherproof jacket. The luggage moving service means you can travel light during your walks, just taking with you what you need for the day. Your main luggage will be transported by vehicle between the different night stops by local taxi, hotel owners or tour staff. It is important to consider that it may be necessary to carry your bags short distances at the start and towards the end of your holiday. You will need the appropriate luggage. 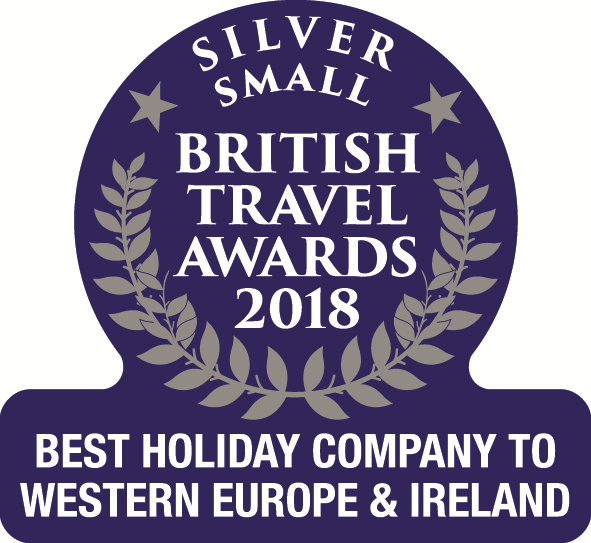 The accommodation on this tour is a mix of mountain refuges, simple auberges and bed & breakfasts, offering hearty food and a warm Corsican welcome. Breakfasts are continental style. Evening meals are simple local specialties and there can often be a limited choice. We recommend that you bring your preferred trail food, or high energy bars for the walks. Picnics can be purchased daily from bakers or small supermarkets. Bring sufficient to cover your personal expenses including snacks and drinks. Bottled water, soft drinks, beer and wine, coffee are all expensive. It is not possible to change money on the tour and trying to find a cash machine can be problematic. We recommend bringing all the Euros you need with you in cash. It is a good idea to get fit for this trip. The more time you put in before you leave, the more you will get out of the walking. You should do regular aerobic exercise in preparation for the hills. Walking regularly with a rucksack is the best way to make sure you are fit enough for the Corsican hills and enjoy the trip to the fullest. You can expect to encounter some very wide ranging temperatures. During the walks you should be ready for everything, take powerful sun protection, as well as warm fleeces and weatherproof jacket. Corsica is known for its micro climates and each valley can be very different. The weather can change quickly and the mountains generate some stormy, often unpredictable weather. A small day pack for your water bottle, camera, picnic and weatherproof. First aid - we recommend that you bring your own personal first aid kit consisting of: antiseptic cream, throat lozenges, diarrhea treatment, painkillers, plasters and blister treatment, re-hydration. Glucose tablets or malt loaf and multi-vitamin tablets are a good idea. During this trip you will stay six nights in accommodation on half-board, and one night in accommodation on bed & breakfast.